Nobel laureate Halldór Laxness’ Under the Glacier is a one-of-a-kind masterpiece, a wryly provocative novel at once earthy and otherworldly. At its outset, the Bishop of Iceland dispatches a young emissary to investigate certain charges against the pastor at Sn?fells Glacier, who, among other things, appears to have given up burying the dead. But once he arrives, the emissary finds that this dereliction counts only as a mild eccentricity in a community that regards itself as the center of the world and where Creation itself is a work in progress. 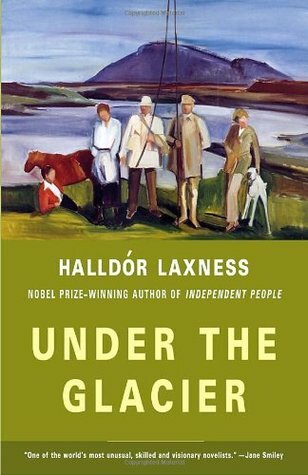 Under the Glacier is the second book by Laxness I have read. It is a different style from Independent People, but I loved it just as much. The story hooked me from the first page, and the characters were memorable and delightful. Laxness creates a perfect balance between humour and philosophy that kept me turning the pages, eager to see what strange events would take place next under the watchful gaze of the poor emissary. As a short read, this would be an excellent introductory piece for those new to Laxness' writing.